A 55-year-old male with chronic dyspnea is intubated and started on mechanical ventilation for respiratory failure Pressure-volume scalars on the ventilator show decreased change in volume for each unit change in pressure as compared to normal values. 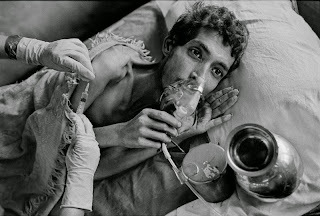 Of the following options, which is the most likely cause of his respiratory failure? This is a chest X ray of a 60 year old male. Presenting with history of alleged fall and right sided chest pain. His X rays are displayed here. The two X rays are 3 days apart. Observe the X rays and answer these questions. 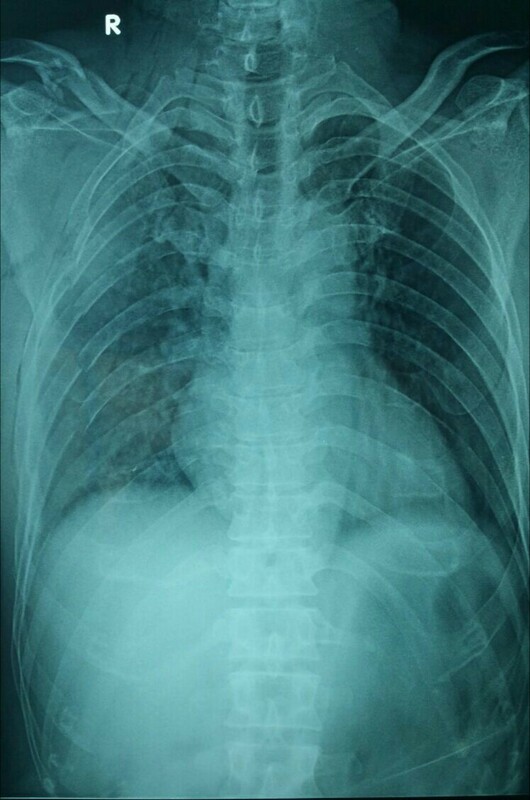 2.The second X ray has worsened than the first one. What is the cause? 3. What can we expect in the CT thorax? The answer is b. "Kartagener syndrome"
A teenage boy presents with a history of chronic sinusitis and frequent pneumonias. On physical examination, the patient has normal vital signs and is afebrile. He has mild frontal and maxillary sinus tenderness with palpation. Transillumination of the sinuses is normal. Heart sounds are best heard on the right side of the chest. The boy is coughing copious amounts of yellowish sputum. 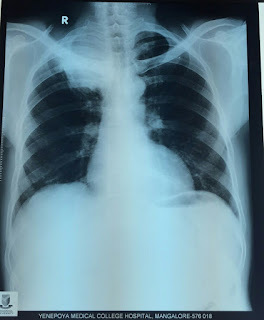 The chest X ray is shown. 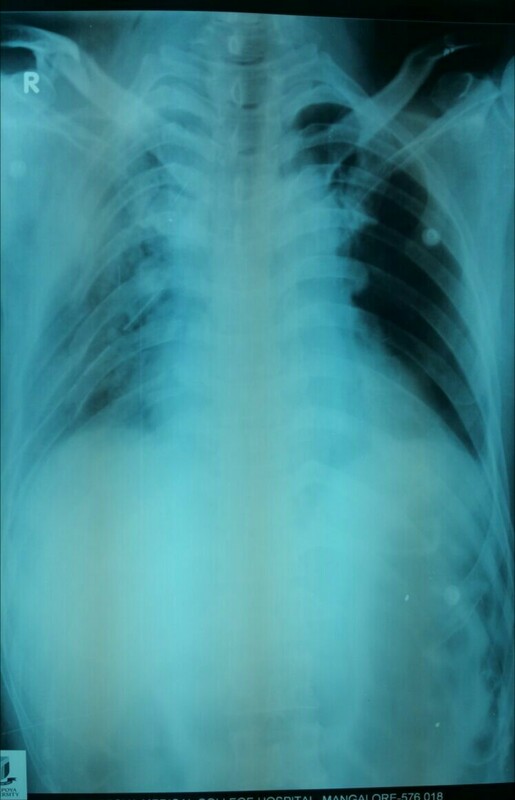 A 21-year-old male presented with a 2-year history of progressive shortness of breath on exertion and dry cough. At physical examination, auscultation of the lungs has revealed random wheezes and coarse crackles. Cardiac auscultation was normal, and no cyanosis or peripheral edema was observed. There was no history of smoking or previous known pulmonary disease. On routine blood examination, blood counts and serum chemistries were found to be normal. Arterial blood gas analysis and echocardiography showed no important abnormalities. Pulmonary function tests (PFT) showed a mild restrictive ventilatory defect, with a reduced total lung capacity of 79% (5.94 L), forced vital capacity of 80% (4.18 L) and a forced expiratory volume in one second of 83% (3.72 L). The sputum was negative for acid-alcohol resistant bacillus and human immunodeficiency virus testing was negative as well. The Chest X Rays and CT are given Below. 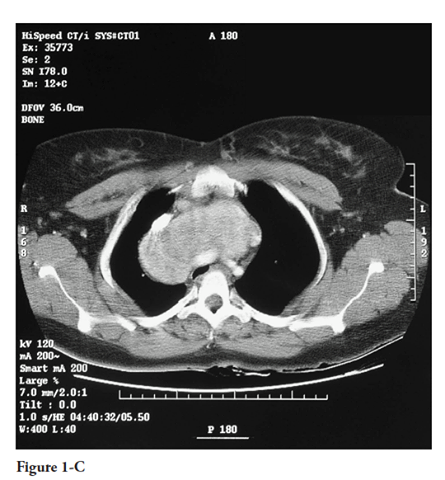 Based on the chest X Ray and CT scan what is your Diagnosis and How can it be managed? Visit on tuesday for the ANSWER. Mr X came to the out patient department with hemoptysis since 2 weeks, and chest pain in the right upper part anteriorly since 2 weeks. On questioning he further revealed weight loss since 2 months. Chronic smoker with 60 pack years. Examination revealed grade 3 clubbing. Clinical examination was normal. This Chest X ray was taken. 1. What does the CXR show? 2. What is the differential diagnosis ? BUY ONE OF THE BEST BOOKS FOR CHEST RADIOLOGY! CASE OF THE WEEK- "Chest Medicine challenge"- case no 03( 24th April- 1st May). A 20-year-old woman comes to the ED with a 2-week history of gradually progressive shortness of breath, orthopnea, and dysphagia. She reports an 18-lb (8 kg) weight loss and subjective fevers over the same period of time. She also describes chest tightness and a nonproductive cough. The patient was empirically treated by her private physician with a course of antibiotics without improvement 7 days ago. She was told that there was an abnormality on her chest radiograph and a chest CT scan was performed, but she did not follow up on the results. She is a never-smoker and has no history of asthma. On physical examination, the patient is in mild-to-moderate respiratory distress with a respiratory rate of 32/min; BP, 152/84 mm Hg; and pulse rate of 130/min. Her temperature is 38.4° C. Neck examination reveals jugular venous distention. On lung examination, there is diff use wheezing. Her current posterior-anterior and lateral chest radiographs are shown (Figs 1-A, 1-B). 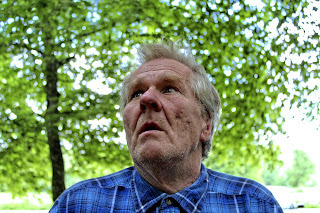 A chest CT scan is ordered, but the patient becomes more short of breath (accentuated when supine in preparation for the CT scan), restless, and confused. Her respiratory rate increases to 40/min, and her oxygen saturation is 88% when breathing 50% oxygen by face mask. A. Awake intubation in the semiupright position. Please come back on Tuesday for answer. Its Tuesday and here is the answer for the chest Medicine challenge 2. Raise your hand if you answered D to Friday's CHEST Challenge question! Nice work! Read on for complete rationale. 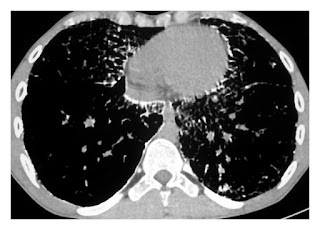 The CT scan reveals several cysts in the left lung and scarring at the right apex related to the previous surgery. A history of recurrent pneumothorax, lung cysts, and skin lesions (fibrofolliculomas) with normal lung function is consistent with the diagnosis of Birt-Hogg-Dubé syndrome (BHDS) (choice D is correct). Langerhans cell histiocytosis is characterized by diffuse cystic disease of the lung, spontaneous pneumothorax, and airway obstruction related to cigarette smoking. These findings are not present in this patient (choice A is incorrect). Similarly, airflow obstruction, recurrent pleural effusions, and diff use pulmonary disease are characteristic of LAM, features that also are not found in this patient (choice B is incorrect). 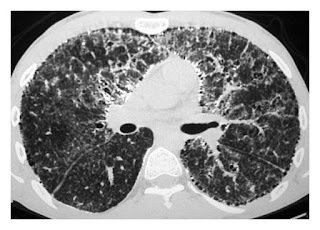 Sarcoidosis is a granulomatous inflammatory lung disease characterized by diff use parenchymal opacities, airflow obstruction, and possibly, skin lesions. 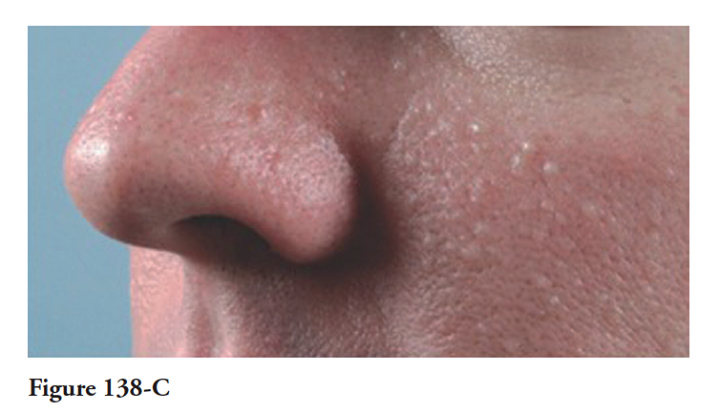 Lupus pernio, one of the skin manifestations of sarcoidosis, appears as purple nodules on the nose, cheeks, and ears, and none of these features is present in this patient (choice C is incorrect). BHDS is an autosomal dominantly inherited genodermatosis that predisposes a person to the development of cutaneous hamartomas (fibrofolliculomas), kidney neoplasms, lung cysts, and spontaneous pneumothorax. The BHD locus has been mapped to the short arm of chromosome 17(17p11.2). BHD is composed of 14 exons, and more than 40 unique mutations in BHD have been reported. Most BHD germline mutations are frameshift or nonsense mutations that are predicted to truncate the BHD protein, folliculin. Patients exhibit multiple 1- to 5-mm white-colored or skin-coloured papules distributed over the face, neck, and/or upper trunk, which histologically, are fibrofolliculomas (Fig 138-C). BHDS is associated with a unique histologic spectrum of bilateral and multifocal kidney tumors ranging from hybrid oncocytic (67%) to chromophobe renal carcinoma (23%) to oncocytic renal carcinoma (3%). Clear cell renal cell carcinoma (3%) has also been reported in a few patients with BHDS. 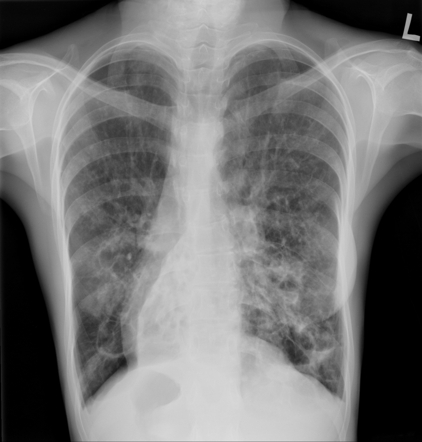 Pulmonary manifestations are a major feature of BHDS. Most patients who are affected (89%) have multiple pulmonary cysts. 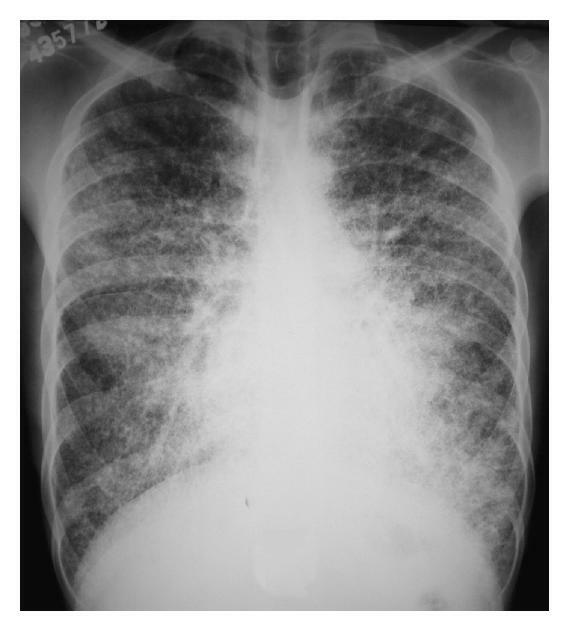 The number of lung cysts is clearly related to the risk of pneumothorax. Approximately one-quarter of patients with BHDS have a history of one or more pneumothoraces. Smoking does not appear to be a risk factor for pneumothorax in this population. Toro JR, Wei1 MH, Glenn GM, et al. BHD mutations, clinical and molecular genetic investigations of Birt-Hogg-Dubé syndrome: a new series of 50 families and a review of published reports. J Med Genet. 2008;45(6):321-331. Toro JR, Pautler SE, Stewart L, et al. Lung cysts, spontaneous pneumothorax, and genetic associations in 89 families with Birt-Hogg-Dubé syndrome. Am J Respir Crit Care Med. 2007;175(10):1044-1053. Pavlovich CP, Grubb RL III, Hurley K, et al. Evaluation and management of renal tumors in the Birt-Hogg-Dubé syndrome. J Urol. 2005; 173:1482-1486. It is Friday and it is the time to test yourself. Here is the case of the week for 17th-24th may, please come back on Tuesday for answers.. THIS BOOK SHOULD BE IN THE COLLECTION OF ALL MEDICAL STUDENTS, VERY CONCISE AND HANDY BOOK!!! BUY IT NOW. THE ANSWER FOR FRIDAYS Chest Medicine Challenge is C. Read The complete Rationale. Next Question will be posted on Friday.Bookmark this site for easy access. 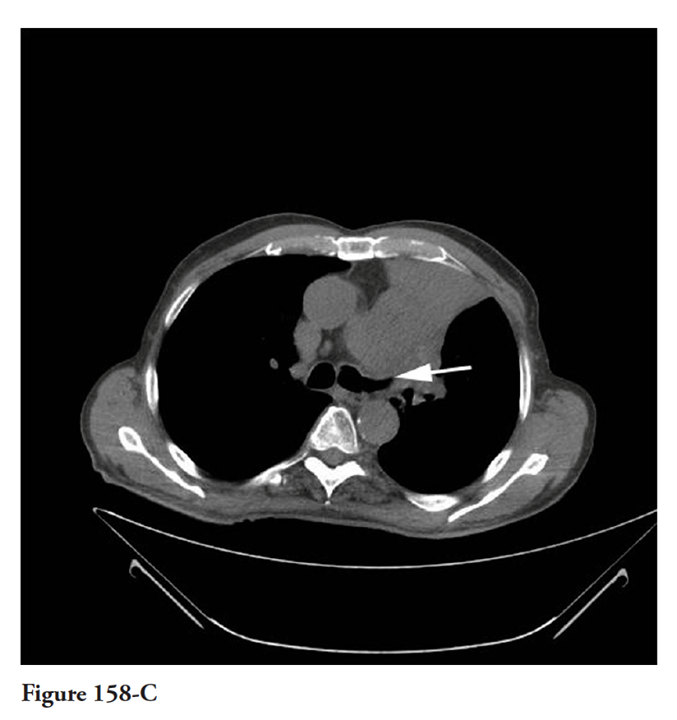 This patient has developed complete LUL collapse as noted on the CT scan in Figure 158-C (choice C is correct). Careful review of the plain frontal chest radiograph illustrates the main features of complete LUL collapse. The LUL is bigger than the right upper lobe due to the usual lack of a minor fissure on the left. When the LUL collapses, it tends to collapse anteriorly and somewhat superiorly and medially. 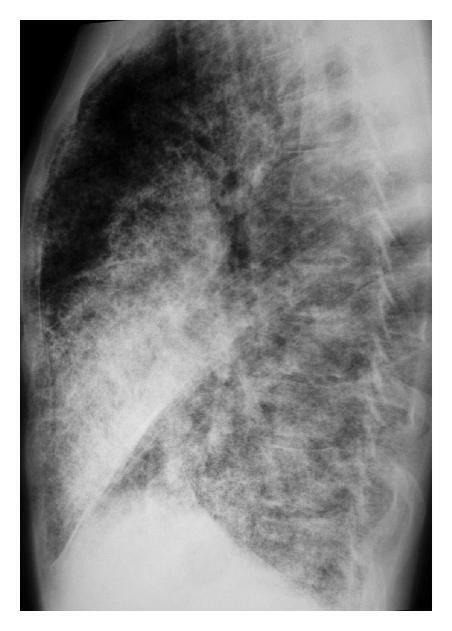 On the frontal chest radiograph, there is a left hazy opacity/density in the upper left lung field (see Fig 158-A), which is readily apparent when the upper hemithoraces are compared. Due to volume loss, there is elevation of the left hemidiaphragm, upward retraction of the left hilum, and sometimes tracheal deviation to the left. The left pulmonary artery occupies the AP window. Because the lingula is part of the LUL, it appears as a hazy opacity silhouetting the left heart border, resulting in obscuration of this border. Sometimes, vessels from the lower lobe can be seen presenting as linear opacities running vertically on the radiograph. The hyperexpanded left lower lobe (LLL) occupies the hemithorax, and the superior segment occupies the apical region of the hemithorax appearing as aerated lung. 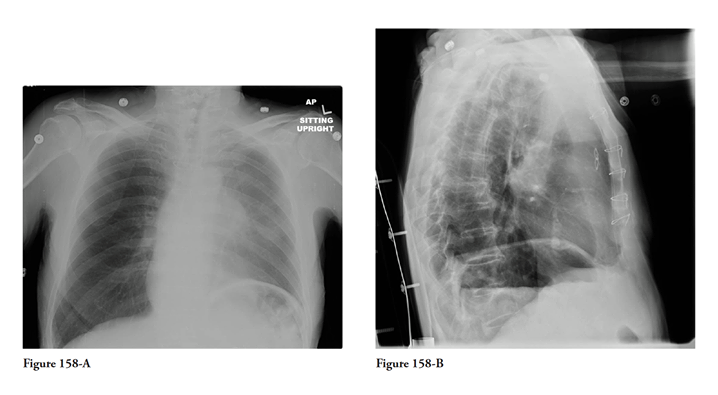 Sometimes, but not well demonstrated in this patient, there is a portion of the superior segment of the left lower lobe between the mediastinum and the collapsed left upper lobe abutting the arch of the aorta. The luftsichel, or air crescent sign is the name given to the appearance of aerated lung in this area. Alternatively, there may be loss of a discrete left mediastinal border, and obliteration of the aortic contour. The chest CT scan illustrates the complete LUL collapse, showing the collapse anteriorly and medially with anterior displacement of the left major fissure. 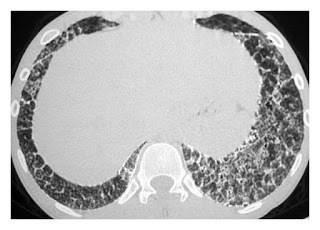 An endobronchial cut off sign of the LUL bronchus consistent with obstruction is noted (Fig 158-C, arrow). Bronchoscopy revealed an extrinsic endobronchial lesion, and pathologic findings revealed small cell carcinoma in this patient. 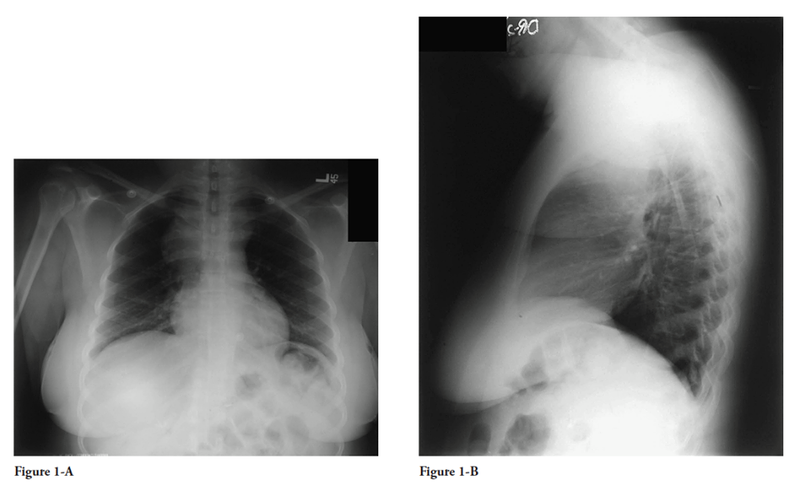 The findings of LUL collapse can sometime be confused with pleural thickening because of the density and the nonsegmental borders, but careful review of the other radiographic features suggest LUL collapse (choice D is incorrect). A left pleural effusion, even if loculated, would appear denser, and one would not see superimposed lung markings (choice A is incorrect). 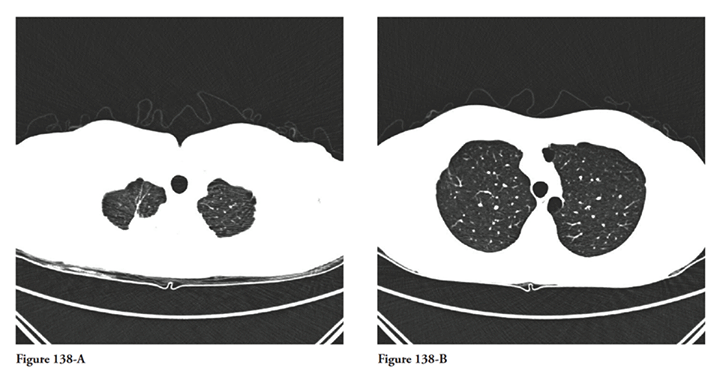 Consolidation would appear dense with air bronchograms (choice B is incorrect). Proto AV. Lobar collapse: basic concepts. Eur J Radiol. 1996;23(1):9-22. Mintzer RA, Sakowicz BA, Blonder JA. Lobar collapse: usual and unusual forms. Chest. 1988;94(3):615-620. Woodring JH, Reed JC. Radiographic manifestations of lobar atelectasis. J Thorac Imaging. 1996;11(2):109-144.